The Pluto science community is rich and diverse, just like its target of study: the ever-fascinating Pluto and its satellite moons. This blog entry concludes my series of talk summaries for the July 22-26, 2013 Pluto Science Conference, “The Pluto System on the Eve of Exploration by New Horizons: Perspectives and Predictions.” You can read more about the conference and browse through the abstracts at the conference website. In his closing comments, Alan Stern (SwRI), the lead scientist (Principal Investigator) for NASA’s New Horizons fly-by mission to Pluto, told us about the last time a scientific discussion gathering specifically about Pluto occurred. 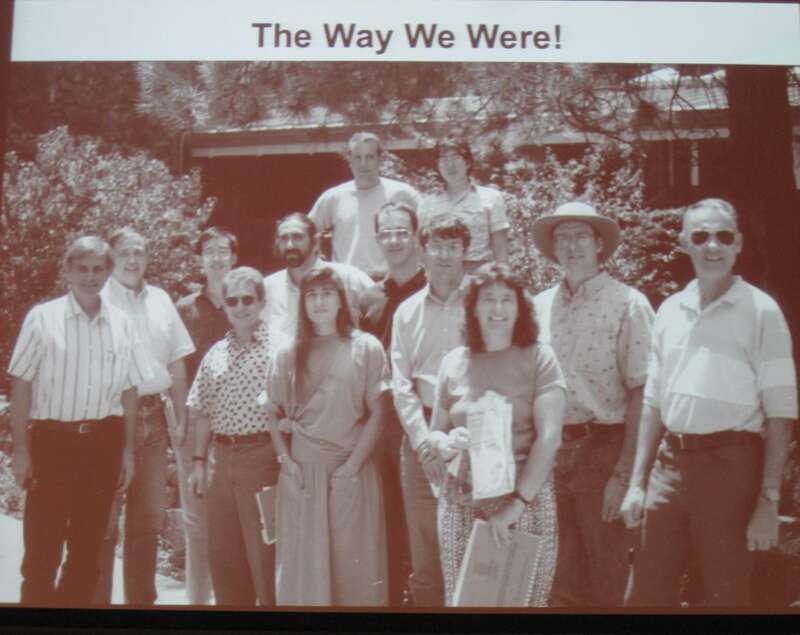 It was twenty years ago, a 3-day meeting in July 1993, in Flagstaff, Arizona. 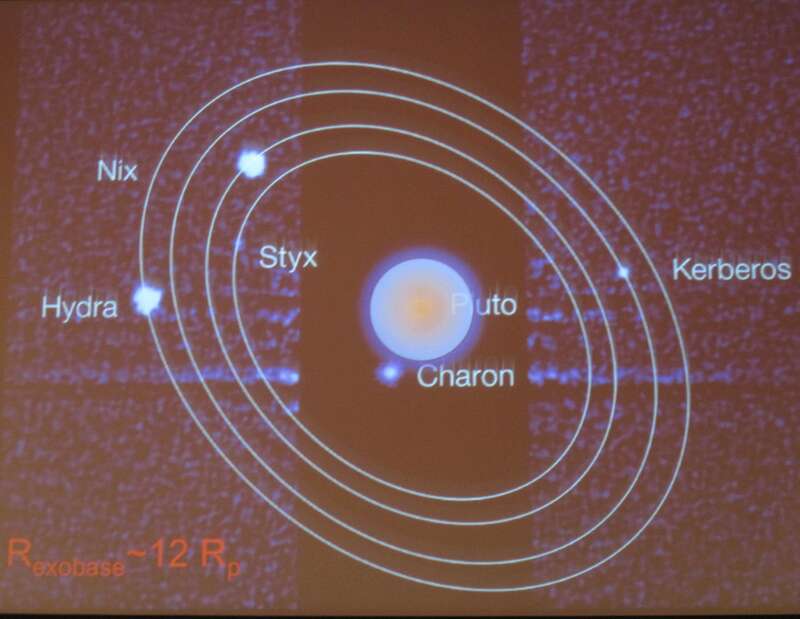 The talks and presentations from that workshop led to ten contributed papers in a special issue in 1994 in Icarus (Vol 108, Issue 2) and, in 1997, the publication of a book entitled “Pluto and Charon” by The University of Arizona Press. When the group gathered in 1993, the 1989 Voyager 2 fly-by of Neptune’s moon Triton’s was still “fresh data”, the prime Pluto-Charon “Mutual Events Period” of the 1985-1990 had just ended, and the Hubble Space Telescope (HST) would be soon coming back on-line with its fixed optics (the 1st HST servicing mission would occur in December 1993). It was a busy time for the Pluto science community. Some attendees at the open workshop meeting on Pluto & Charon in July 1993, Flagstaff, Arizona. 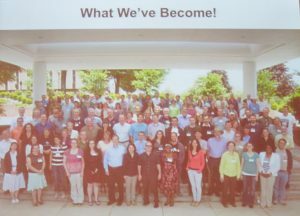 This five-day July 2013 meeting has demonstrated that the quest to better understand Pluto and its environment is a very rich and diverse field of study. With each new data set about Pluto and its companions, surprises are uncovered and new questions are posed. When the New Horizons spacecraft reaches the Pluto system in July 2015, a true “first encounter experience,” its on-board suite of modern instruments will transform our current-best resolution ~800 km/pixel (from Hubble observations) to a resolution of 0.46 km/pix (hemisphere) with 0.09 km/pix (regional) resolution with the LORRI instrument. You can be certain there will be a lot more surprises in store. Combining this with new and unique data sets from New Horizons’ particle & dust instruments and the UV and IR spectrometers, our understanding of the Outer Solar System will find a new grounding. 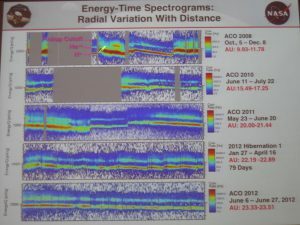 With 103 oral talks + 30 posters + 13 “topical sessions” this was a jammed pack week of sharing old information, sharing new data from the past few years, sharing “hot off the press data” (it’s Pluto observing season right now and during the conference attendees were doing observations of Pluto & Charon with IRTF, Keck and other telescopes, remotely or with their colleagues at the telescopes), identifying what computations or experiments are needed before the 2015 encounter, and in some cases, providing predictions of what might be detected at Pluto and Charon. Several papers presented at this conference will be submitted to the Icarus journal. Attendees at the “The Pluto System on the Eve of Exploration by New Horizons: Perspectives and Predictions,” held July 22-26, 2013, in Laurel, MD. The topical sessions covered Atmospheres, Charon, Dust & Rings, Interiors, Kuiper Belt Context, Laboratory Studies, Magnetosphere, New Horizons Mission, Origins, Satellites, Surface Composition, Surface Geology, and Surface-Atmosphere Interactions. The stage is set for a summer 2017 Pluto Science Conference. New Horizon’s flyby of the Pluto System is on July 14, 2015, but it will take a bit over a year for all the data to come down losslessly (i.e. without compression). Deliveries to the NASA’s Planetary Data System are planned in 2016 and early 2017. I hope you enjoyed this blog series reporting on these intriguing topics. You can follow the New Horizons mission status at any time by visiting the New Horizons Mission Website at http://pluto.jhuapl.edu/ and http://www.nasa.gov/mission_pages/newhorizons/main/index.html. Pluto Exotica. Atoms. Pick Up Ions. Bow Shocks. Suprathermal Tails. X-Rays. UV airglow. The morning of the last day of this week’s July 22-26, 2013, Pluto Science Conference opened up the discussion with outer atmosphere (far out) and magnetosphere (really far out) talks. Fran Bagenal (University of Colorado) started the session with a talk on “The Solar Wind Interaction with Pluto’s Escaping Atmosphere.” Pluto’s interaction with the solar wind was first suggested in 1981 by Larry Trafton. There are two generally predicted regimes of what this interaction might look like: (1) Venus-like (small escape rate) and (2) Comet-Like (high escape rate). A key parameter distinguishing the two is what the atmospheric escape rate might be, that is, how many atmospheric molecules (assumed to be nitrogen) are escaping from Pluto, no longer being bound by gravity. Current estimates for the escape rate, based on a number of approaches, notably a recent one by Darrell Strobel (2012), have this number at 2-5×1027molecules/sec. This is large enough to suggest Pluto will appear to be “comet-like” in its interaction with the solar wind. However, we need to wait until 2015 for the New Horizons fly-by with their in-situ particle instruments SWAP & PEPSSI to make the interaction measurements. When describing the Pluto System in terms of solar wind interaction, Fran Bagenal showed this image, which superimposed one of Darrell Strobel’s atmospheres (characterized with an exobase at 12 Pluto radii). Pluto becomes a “large object” for interaction with the solar wind. When solar wind particles (protons) interact with the Pluto atmosphere, their path through space is bent along the magnetic field lines, and to convert momentum, pickup ions (neutral hydrogen atoms from the heliosphere that undergo a collisional charge-exchange interaction with solar wind protons, get ionized, are “picked up” by the solar magnetic field) get tossed onto new trajectories. Those ions are charged and will begin to rotate and follow electrical field lines. Where do the ionized particles go? A weak magnetic field will create large gyro-radii of pick-up ions which can extend millions of kilometers upstream of Pluto. This is best modeled with a kinetic interaction. Peter Delamere (University of Alaska, Fairbanks) spoke in greater detail about “The Atmosphere-Plasma Interaction: Hybrid Simulations.” Plasma interaction is an atmospheric diagnostic tool. Neutral gases are not easily picked up, but ions and how they interact with the solar wind can be detected with in-situ instruments such Hew Horizons’ SWAP and PEPSSI. 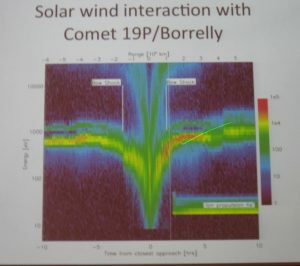 He discussed his model plasma interaction mode, which was validated using Comet 19P/Borrelly that had been visited by Deep Space 1 on Sept 22, 2001. Example of Comet 19B/Borelly environment time vs. energy reveals the structure of the interaction between a comet and the solar wind. The X-axis is time from closes approach, with the Y-axis energy. The color code is the number of particles counted by the PEPE instrument aboard Deep Space 1. This is similar to what the data is expected to look at for Pluto when New Horizons reaches it in 2015, however, the solar wind at 33 AU may be more extended and more diffuse and therefore the signal strength (in terms of counts) will be much less. If we can understand where the bow shock forms, this becomes a diagnostic of the atmosphere, and if indeed the exosphere extends out to 10 Pluto radii as suggested by recent work by Darrell Strobel (2012) and other models, then this is a sizable ‘obstacle.’ But is it inflated enough to form a bow shock? Peter Delamere thinks so. He stepped us through a variety of simulations. One of the simulations predicts a partial bow shock. If you increase Qo (the escape rate parameter, predicted to be in the 2-5×1027 N2 molecules) or increase magnetic field strength you can create a full bow shock. Future work includes adding the pickup part of the solar wind model as input. If there is a very slow momentum transfer, perturbed flow could extend out to an AU. Simulations predict all sorts of shock structures (Mach cones, bow shocks), but these structures depend on the escape rate parameter. Example of a plasma interaction mode for three escape rates, decreasing from right to left. This is a slide in space of plane vs. distance from. The white lines are sample solar wind proton trajectories. The color scale indicates ion density. The solar wind (and hence, the direction from the sun) is incident from the left. Pluto is at (0,0). Predictions at Pluto. He anticipates significant asymmetry. The predicted bow show could be as far as 500 Pluto radii. Heather Elliot (SwRI, San Antonio) in her talk “Analysis Techniques and Tools for the New Horizons Solar Wind around Pluto” described the New Horizons SWAP instrument and the different rate modes (sampling rate and scan types) it will be using during the 2015 encounter. 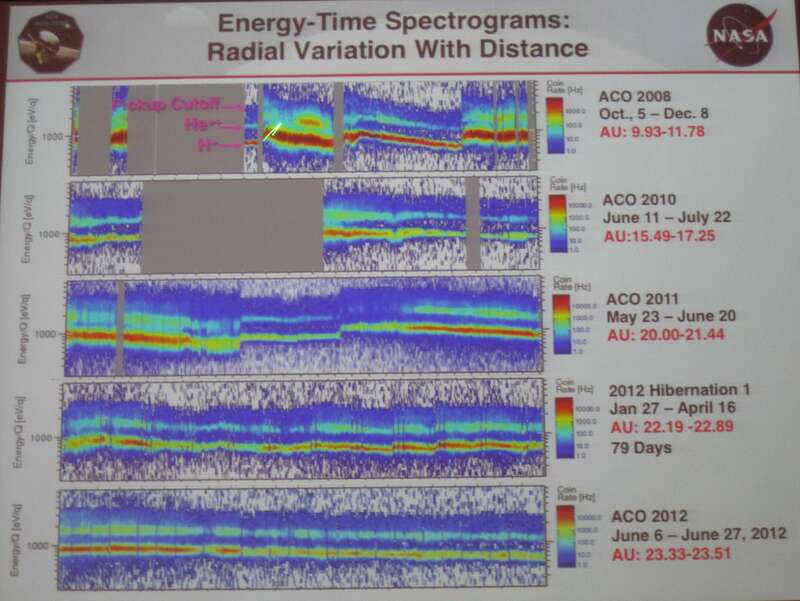 Measurement of the solar wind taken with the SWAP instrument aboard New Horizons during the last 6 years of cruise. This data set covers AU=10 (Saturn distance) out to AU=23 in 2012. The solar wind is mostly protons (H+). The second most abundant species are alphas (He++). The colors are the intensity of species. The vertical axes are energy per charge units and the horizontal axis is time. Fitting the SWAP data to a solar wind model requires making adjustments for view angle and during the hibernation period, when they do not have attitude information, they have modeled the Sun-probe-Earth angle to estimate the attitude and this works well to fit their data. John Cooper (NASA Goddard) spoke about the “Heliospheric Irradiation in Domains of Pluto System and Kuiper Belt.” He is interested in computing the “radiolytic” dosage onto bodies in the outer solar system (that is, the effect of how molecules break down or change molecular band structure due to the influence of radiation, such as by cosmic rays, particles, UV, etc.). For this he needs measurements of the particle flux at large AU. New Horizons joins its cousins Voyager 1 & 2, Pioneer 10 & 11 and Ulysses in exploring the outer solar system. Location of the NH spacecraft (orange on the left, purple on the right) for two different views of the solar system. Also plotted are deep space missions Voyager and Pioneer, among many. The left view is s top down view of the solar system with the Sun at (0,0), the axes are in AU, where 1 AU (Astronomical Unit) is the distance between the Earth and Sun. The right is a view of time vs. latitude for the crafts. Comparative data sets to New Horizons, which travels along the solar ecliptic, are Pioneer 10 and early Voyager 2 data. He showed computations of irradiation dosage when applying those particle rates measured by New Horizon’s PEPSSI instrument and instruments aboard Voyager 2 and Pioneer 10. He maintains a database of all particle instrument flux measurements at the Virtual Energetic Particle Observatory http://vepo.gsfc.nasa.gov. Thomas Cravens (JHU/APL) with ”The Plasma Environment of Pluto and X-Ray Emission: Predictions for New Horizons,” asked “What happens when you get to within 1000 km of Pluto?“ Pluto is anticipated to be “Comet-Like” in its interaction with the solar wind, however when you get closer to Pluto (around 1000 km), it may more closely resemble “Venus-like” interaction. He is trying to compute where the charge-exchange boundary could be, probably around r~5000km. This is boundary between the kinetic (r>5000km) and fluid (r<5000 km) regimes, essentially probing the ionosphere regime of Pluto. Switching to slightly lower energies, Casey Lisse (JHU/APL) gave a talk on “Chandra Observations of Pluto’s Escaping Atmosphere in Support of New Horizons.” X ray interactions (charge exchange, scattering and auroral precipitation) require an extensive neutral atmosphere, which is what is expected at Pluto. Interaction of solar wind with comets has consistently shown X-ray emission. He expects to see X-ray emission from Pluto. If detected it would tell us about the size and mass of Pluto’s unbound atmosphere. The best time to look for x-rays at Pluto is about 100 days after a large CME (corona mass ejection) event, which is about the time it takes for CME to get to Pluto at 33 AU. He and his colleagues applied for, and got, time on NASA’s Chandra X-ray telescope. On Chandra, Pluto & Charon will appear to fill one Chandra pixel using the Chandra HRC instrument. He ended his talk suggesting that looking at background counts with the LORRI and RALPH CCDs might serve as a poorman’s x-ray detector. It is also possible that PEPSSI background counts could be used to infer presence of lower X-rays. The measurement will be the UV spectral observations during the solar occultation of Pluto by the Alice instrument during the New Horizons fly-by. N2 is the dominant absorber between 80-100nm. To identify the molecule 14N15N they use an atmosphere model from Krasnopolsky & Cruikshank (1999). That model does not have a troposphere. Next they need absorption cross-sections (a parameter that quantifies the ability of a molecule to absorb a photon of a particular wavelength) for 14N2 and 14N15N. 14N2 is the more dominant species and they are trying to find a very small percentage for 14N15N. Using these simulations they anticipate the Alice instrument will be sensitive enough to detect at least a 14N15N to 14N2 ratio of 0.3%. They will be look at the UV spectrum between 88 and 90 nm where the 15N lines spectrally shifted from 14N line. 14N15N to 14N2 ratio has been measured on Mars (0.58%), Titan (0.55%), and Earth (0.37%). What ratio will Pluto have? New Horizons data will hopefully tell us. Randy Gladstone (SwRI, San Antonio) spoke about “Ly-alpha at Pluto.” Pluto ultraviolet (UV) airglow line emissions will be very weak, except at HI Lyman-alpha (Ly-a). Ly-a at Pluto could have both a solar (Sun) and an interplanetary (IPM/interplanetary medium) source. Ly-a should be scattered by Hydrogen atoms in Pluto’s atmosphere. He uses the Krasnopolsky & Cruikshank (1999) Pluto atmosphere model that predicts the number of Hydrogen atoms at altitude. There are several observations near Pluto closest approach planned with the New Horizons Alice instrument to measure Lyman-alpha emissions. This data will provide information about the vertical distribution of H and CH4 in Pluto’s atmosphere. Observation of the IPM Lyman-alpha source will be unique and provide important information to model Pluto’s photochemistry, especially for the nightside and winter pole region. Randy Gladstone (SwRI, San Antonio) ended the session with a talk about “Pluto’s Ultraviolet Airglow.” He presented a model by Michael Stevens (Naval Research Lab), which has been used to explain the Cassini UVIS (Ultraviolet Imaging Spectrograph) observation of UV airglow at Titan over the 80-190 nm wavelength, emissions arising from processes on N2 (Stevens et al 2011). The model is called AURIC, the Atmospheric Ultraviolet Radiance Integrated Code. This model will be used for interpreting Pluto atmosphere data taken at UV wavelength with the New Horizons Alice instrument. If Pluto was not already an exotic place to visit with all the predictions about its formation, its interior, its surface, it surface-atmosphere interaction, its composition, etc., it certainly will prove to be an amazing place if any or all of these predicted upper atmosphere and mesosphere molecular species, ions, and high energy particles are measured with the New Horizons spacecraft! Winds. Fog. Frost. Global weather predictions on Pluto. 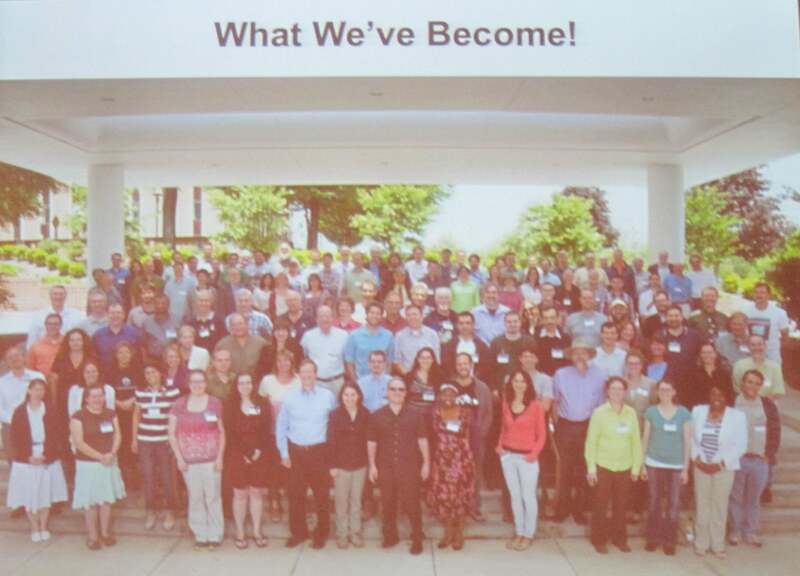 Talk summaries from the Pluto Science Conference held July 22-26, 2013 in Laurel, MD continues. 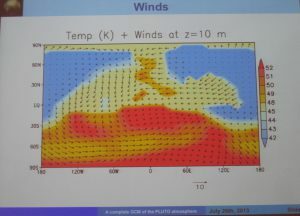 This blog entry is about atmosphere presentations on July 26th. A general circulation model (GCM) solves conservation of momentum in 3D, conservation of mass, conservation of energy and equation of state (P=rRT). It can tell us some fundamental atmospheric properties such as composition (what is it made of), pressure (how much is there? ), temperature (how hot is it? ), and wind (how does it move?). In particular, understanding wind is one of the most important things a general circulation model gives you, because it is so hard to observe remotely. She presented her model, based on the MIT (Massachusetts Institute of Technology) GCM that was originally designed as an ocean model. She turned it upside down to make it an atmosphere model. It has multiple layers, CH4 mixing ratio at 1%, CO mixing ratio at 0.05%, includes atmosphere models (Strobel et al 1996) and runs for a 15 year Earth integration rate (she notes that is probably not enough time to have the atmosphere equilibrate). 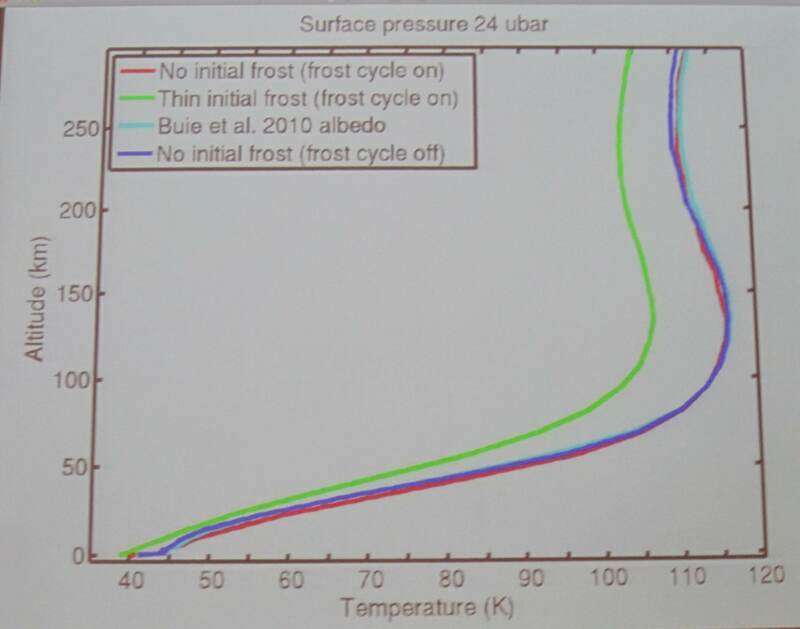 She sets frost layers on the surface as a parameter, and explored different surface pressures (8 16, 24 microbars). She uses the Ecliptic North convention. One output from this model are curves of temperature vs. altitude, called a temperature profile. She reported the presence of a frost predicts a much colder atmosphere. Future work will be to investigate other ice distributions, put in a CH4 transport model, and improve surface model. 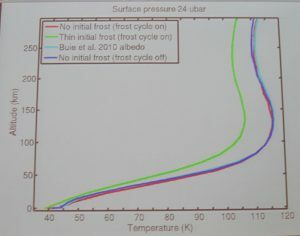 Example of a suite of temperature profile curves from the Pluto MIT GCM. Temperature in Kelvin is shown for a range of altitudes in kilometers. The MIT GCM has assumed a particular Pluto radius to set zero altitude. Example of a wind prediction from the Pluto LMD GCM. The temperatures (in K) are represented by the color and the arrows represent the wind direction and speed at particular height. This is mapped onto a lat/long grid using the right-hand-rule (i.e. matches the Marc Buie convention). Anthony Toigo (JHU/APL) with his talk “The Atmosphere and Nitrogen Cycle on Pluto as Simulated by the PlutoWRF General Circulation Model” presented a third general circular model. Their GCM is based on the terrestrial model used for Weather Research and Forecasting (WRF). It has been adopted for Mars, Titan and Jupiter, and they have adopted it for Pluto. They ran their model for two extremes of thermal inertia, as this is a current open question in the community. They are just attempting to see what effect this has on the predictions. 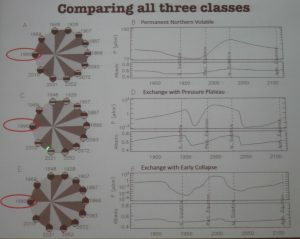 They also looked at the effect of the nitrogen cycle adjusting amount of nitrogen ice. Conclusions. The model is in agreement with the increase in pressure derived from observations, supports large volatile abundances, and shows a pole-to-pole transport. Future work for Pluto includes constraining the volatile cycle and looking at surface wind relations. The three modelers sparked a lively debate at the Pluto Science Conference. Sometimes they agree and in many cases they diverge greatly. It was neat to see how different groups tackle the same physics problem. It came down to the details and initial assumptions. GCMs have become such powerful tools to describe dynamics (changes) in atmospheres, but because there are still so many assumptions about Pluto’s surface and atmosphere, it will only be until New Horizons provides measurements to start anchoring down these models. Coordinate systems do matter. Brush up on that Right Hand Rule, y’all. 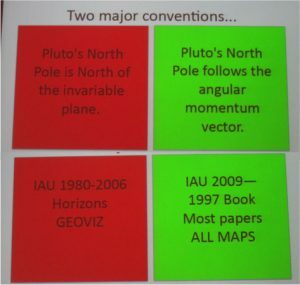 This is a blog series covering the talks presented at the Pluto Science Conference, held July 22-26, 2013 in Laurel, MD. In an engaging talk by Amanda Zangari (SwRI) entitled “Plutography: A Meta-Analysis of Coordinates on Pluto From Charon’s Discovery to the Present Day,” she compared and contrasted two coordinate systems used by Pluto researchers. Her motivation is that data sets, past, present and future will be compared to the New Horizons dataset, and so it will be very important that all use the same coordinate system. It comes down to two coordinate systems, although she mentioned that some researchers sometimes use a hybrid-definition. 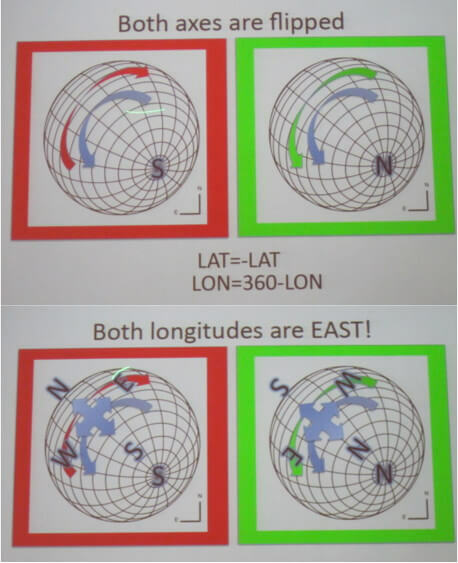 In her visual summary, the Red (left) is the Ecliptic North configuration where Pluto’s North Pole is “North of the invariable plane.” The Green (right) is the where “Pluto’s North Follows the Angular Momentum Vector” aka Right Hand Rule (RHR). 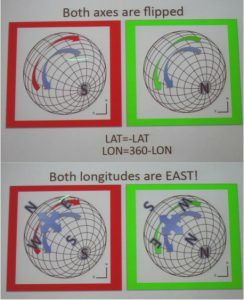 When the planet’s north pole is aligned closely with the Ecliptic North, the former is normally okay (like for Earth). However, for Pluto, Uranus and Venus the two are definitely very different. She suggests that the Right Hand Rule is the more appropriate definition for Pluto. Note that JPL Horizons (their official ephemeris generating software), GEOVIZ (New Horizons Planning software) and SPICE uses the other convention (Ecliptic North Pole). How they differ are summarized below (i.e. both axes are flipped). The pole that is visible from Earth is what is seen in the lower-right quadrant of each schematic. Since the 1980s we have been is observing Pluto’s Northern Pole per the Right-Hand-Rule (RHR) convention. Alan Stern, New Horizon’s Principal Investigator (lead scientist) mentioned that the New Horizons Spacecraft will not change its system prior to the Jul 2015 encounter. After the encounter, the plan will be to adopt the new SPICE files, etc. He stressed that Pluto Data that gets released in the Planetary Data System will be in the Right-Hand-Rule convention (RHR). Leslie Young, New Horizons’ deputy Project Scientist, said that there are new SPICE files available using a Pluto coordinate system using the RHR Convention, although the JPL/SPICE official release is still Ecliptic North. So, huh, which way is up? I’m sure this topic is far from over. In fact, during discussions at the meeting, agreeing on a coordinate system for planetary bodies is no stranger to this community. 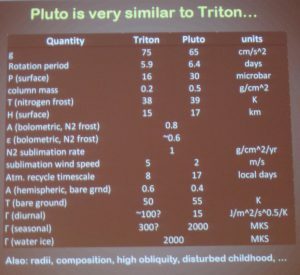 Laurence Trafton (University of Texas) gave a talk on “Driving Seasonal Sublimation and Deposition on Pluto-Uncertainties in Evaluating the Vapor Pressure.” Pluto’s atmosphere is supported by the vapor pressure of its surface ice. For most models, N2, CH4, and CO are assumed to exist solely in solid solution on Pluto’s surface, and are well mixed in atmosphere. 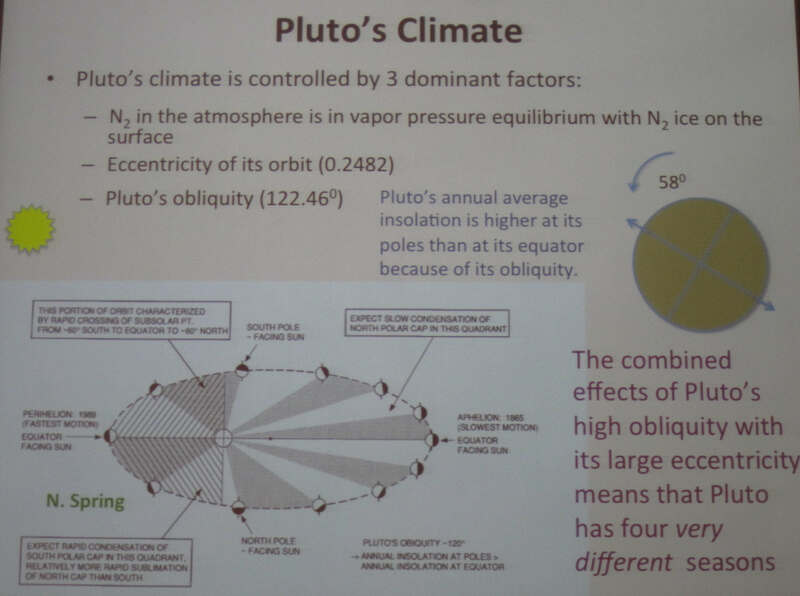 However, this did not explain the mystery of Pluto’s elevated atmosphere CH4 amounts (seeabove talk by Stansberry). Two models were suggested: “Detailed balancing model” (DBM) (Trafton 1990) and the “Hot CH4 Patch Model” (Stansberry et al 1996). The latter only needs 1-3% of Pluto’s surface to have this extra source of CH4. Neither model can explain widespread pure CH4 ice hypothesized to be on Pluto’s surface. He is in need of lab experiments to establish vapor pressures for the saturated areas of the phase diagram. 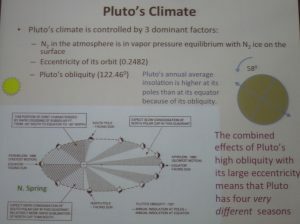 Kevin Baines (University of Wisconsin-Madison) spoke about “Chemistry in Pluto’s Atmosphere and Surface: Predictions of Trace Aerosol and Surface Composition, and a Potential Geologic Chronometer.” There are many sources that drive atmosphere surface chemistry and albedo. For example, volatile transport dominates on days, months, and year timescales. There is UV photochemistry (decade timescale) in this rich atmosphere. Hydrocarbons could be raining out 1mm every 50,000 years. Solar wind and accretion activities (impacts, dust from satellites or KBOs) occur in 1Myr timescales. So, he asked, “What would Galactic Cosmic Rays(GCR) do?“ The types of products by irradiation from CGRs include CH4, CnH2n+2, C6H10, NH3, HCN, etc. over 5-20 Myr. And he proposes they may be viewable by darkening on airless KBOs.